Many thanks to supporter Nigel Harrison for developing an iPhone application as a fun way to promote the Nestlé boycott campaign. This is available in the Apple store - click here. We will shortly be posting a clip of the Nestlé product detector simulator in operation. A boycott ringtone/text alert is also available for mobile phones - click here. Baby Milk Action's fun product detector simulator - for entertainment purposes only. This does not really detect products - you control its operation - and is intended as a fun way to break the ice to explain Baby Milk Action's boycott campaign. It displays a product detector dial and emits a warning note that becomes more insistent as you subtly vary the angle of your phone, flashing a 'product detected' warning when the phone is horizontal. Simply activate the application and move the phone towards a product which is on our boycott list, changing the angle of the phone as you do so. When the alarm sounds you can show the warning and explain why you are supporting Baby Milk Action's boycott campaign. With a little practice, no-one will guess that you are controlling the signal!! The application includes an updated list of UK products that you can consult in advance and a suggested text for explaining the campaign. 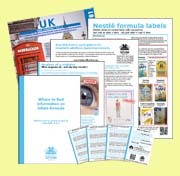 It also links to the Baby Milk Action site, where you will find loads of information, other tools for promoting the campaign and product lists for some other countries.